Hi-Point 45 Auto pistol and 4595TS carbine, self defense on a budget. These test samples feature a new camouflage pattern. The carbine is a woodland type pattern and the pistol is a digital desert type pattern. 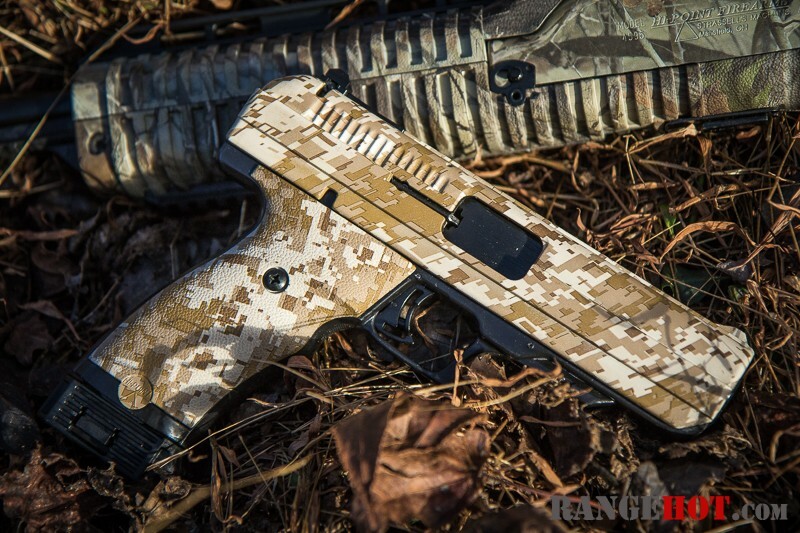 Hi-Point offers several different finishes. In August 2014, I published a review on the Hi-Point 9mm pistol and 995TS carbine, you can read that review here. That was my first real experience with Hi-Points other than shooting a few handguns here and there. There is a lot of hate and malcontent going around about Hi-Point and truthfully I don’t think they deserve it. With the 9mm Luger pistol and carbine I had no failures and accuracy was not bad at all. For an affordable firearm with a no BS life time warranty and all American made, you could do much worse. Next, the review of the Hi-Point carbine and pistol in .45 Automatic with the new camouflage pattern. As far as aesthetics go, other than the new pattern, the .45 Auto is the same as the 9mm Luger carbine and pistol. A close look at the firearms. As you can see the manual of arms of the carbine and pistol are the same in where the safety and magazine release is located. This is very helpful when training and transitioning between the pistol and carbine. Become familiar with one and you are familiar with the other. Note the charging handle on the carbine. The pistol sights are not bad at all. The pistol includes a rear peep type rear sight but I prefer the rear notch. The carbine sights are nice, a traditional military type front sight post with protector, the rear sight is peep sight and adjustable for windage and elevation. The carbine has plenty of Picatinny and Weaver rails. The carbine has a place for check weld, and a spring loaded recoil pad. Though the recoil pad worked well, the carbine recoiled soft so I am not sure it is really needed. The handgun is blowback operated with a fixed barrel. Though it is a bit heavy and blockey the new digital camouflage is, in my opinion, more attractive than the plain black pistols. My biggest complaint on the pistol is it has a magazine disconnect. With the magazine removed, the pistol would not fire. The carbine does not have a magazine disconnect. The magazines are the same and interchange between the pistol and carbine. Many accessories are available for the carbine, here you see a magazine clip, that fixes to the skeletonized buttstock and holds two additional magazines. For the record, these are different than magazine carriers as the are not a closed loop so the magazines can be slipped or popped out. The carbine ships with a sling and you have a few options of attach points on the rear. We took the carbine and pistol out, straight from the box and went to the range. Fifty rounds through each, there were no malfunctions and accuracy seemed on par with the other Hi-Points I have reviewed, so we stepped off to twenty-five yards to get some accuracy groups from both the pistol and carbine. Here are the results from the accuracy test, you can click on the chart for a larger version. If you are curious how the .45 Auto performs out of a carbine, here is the ballistic test that is a direct comparison between a handgun and carbine. As we all know, Hi-Points are inexpensive and will not win any beauty contests but let’s take a moment to look at the good points. From my experience they have proven to be reliable and accurate, not a bulls-eye pistol but way a plenty for what the gun was designed for. Also, they are 100% American made with a no questions asked lifetime warranty. Added all that together and the fact they are inexpensive it is worth at least trying one for yourself and not take the naysayers word. Where I come from the proof is in the pudding. Another thought is many cannot have higher end firearms because they cannot afford to spend a lot of money (please keep in mind a lot of money is a subjective term) so with Hi-Points they have a viable option for a defensive and recreational use. I also know many who say to save up to buy something, but keep in mind it may take some time to get the funds together to buy a more expensive firearm and during that time, well….. Yet another good use of Hi-Points would be something to keep in a truck, toolbox, boat, or tackle box. It is that firearm that will work but you don’t care so much if it gets scratched or beat up. There are a number of good reasons to give one a try. Expanding one’s horizons is not tethered to expensive. Having a carbine chambered in the same caliber as your pistol, both sharing the same magazine, really cuts down on the logistics of supplying ammo. Also many indoor ranges do not allow rifle caliber carbines but with the .45 Auto carbine you would be covered. I agree on all counts. If you have not, check out the torture test video of the .45 pistol. I believe it was done by Handgunners Magazine. Blessed and fun new year! How much drop did you get @ 100yds? I’m holding out for a version in 32ACP. Lots of pocket/boot guns out in that caliber and it seems a logical choice to make one. Great starter gun for ladies & kids, reloadable too. Maybe call it the “Rookie”, double entendre due to the old European rook guns. I can see it with a threaded barrel… imagine this thing suppressed! As far as I’m aware, no one has an offering in this caliber. .32ACP carbine? If one got built you would be the one that did it. LOL! Hi-Point does make a .380 carbine. .380 is cheaper, and more prevalent than 32. It’s usually very expensive, hard to find. It’s amazing how people focus all of there attention on the looks of this firearm……Completely forgetting about it’s sole purpose for existing.. Affordability set aside, is it RELIABLE-/ DEPENDABLE—the answer for ME is YES!!! Yes sir. It ain’t so much the paint job you need to be aware of but what is under the hood that is more important. Chrome won’t get you home. My C9 was sent back to the factory after 3000 + rounds in 6 months due to misfiring. ..a lot. They initially sent me a new spring set and firing pin but no go. Are 3000 rounds alot for a Hi Point or any gun??? How about a 2500 round + comparrison test between various pistols price not being an issue? Revolvers. semi autos. inexpensive to high priced and then let the results speak for themselves? 3000 rounds is not a lot of rounds for any firearm. You have a great ides but for me I do not have the resources or finances to do a 25000 round comparison over so many handguns. That would take around 50,000 rounds to get started and I just can get that much ammo at one time. Thanks for the reply. The gun came back a while back fully repaired. Shoots great and I feel reunited with a friend. I carry the C9 daily. Approximately 4000 rds thru it now. Picking up the 45 this Friday and after….the 45 carbine. Price not with standing as I can afford more expense…for my taste the Hi Points are an excellent firearm and the company behind them is second to none..this is not to bash others choices. Variety is ALWAYS A GOOD THING. Hope your year is prosperous. That is an excellent idea John. Did you see the Shot Show with the HP rep saying the 10mm is on the way? 😉 I wish I had saved that. Pretty sure I posted it on the HPFF’s. Here is the mention of a 10. I misconstrued what he said. And with that High Tower bullpup conversion stock coming out? Ya-boy! Jim, though I cannot speak for Hi-Point directly, I doubt they will produce a longer barrel for the C9 in the near future. When I did a ballistic test comparing the C9 to the CZ 75B Omega with a 4.6″ barrel the ammunition performance was negligible. You can read that ballistic test here https://rangehot.com/pistol-vs-carbine-differences-ammunition-performance/. So adding an inch to the gun, may help with sight radius some it would not offer much in the way of ballistic advantage. I just finished a really disappointing tryout of my 4595, jams, misfeads, sluggish bolt, and what feels like 8 lbs of trigger pull. Can’t close the bolt with a empty clip. Really poor thumb safety design. I guess it’s true about getting what you pay for it. I know your thoughts, what kind of ammo were you using? If I can’t grab a box of 45’s off the shelf, stuff the clips and roll them down range this is not the carbine for me. I demand reliability from the firearms I spend my hard earned money on. It is normal not to be able to close the bolt on an empty magazine, as the carbine was designed to lock the slide back on an empty magazine. Don’t panic, Hi-Point has one of the best warranties in the industry. The first thing would do is clean the carbine well and oil it. Give it another try and if it still gives you trouble get in touch with Hi-Point, they will make it right I promise. OK Hunter here goes…..Ran across both videos on Hi Point carbines…..9mm and 45ACP. Have known of these guys for many years but now in the market. Which one for all around shooting, etc. Cost of ammo, accuracy etc….??? Reload my own shells. Like my 45s but cost and long range accuracy a factor? 9mm doesn’t have slam of 45 though. Your thoughts please and thank you for a reply. Ed, that is tough man. Accuracy, well to be honest at 25 yards, they are similar. The 9mm is for sure cheaper to shoot but you did say you reload so that should not be as much of an issue. Both cartridges benefit from the longer barrel in added velocity for accuracy and terminal ballistics. I know I have not been a lot of help. I kind of favored the .45 Auto just a bit more and for defense it, since magazine capacity is not an issue with the carbine as they are the same, I would pick the .45 Auto but just by a little. Sorry man, I wish I could of helped more. .40 is a flatter shooting round. I have 40’s, 45’s, and the 9’s. The 9’s are the most fun. And now there is a reliable 20rd mag out. Within the next 30 days the 20rd .45acp mags should be out. I am more interested in the 20rd 40’s. Don’t tell the wife! That’s the way I was feeling too Hunter. Flip a coin kinda thing. If it’s worth anything, thought that when the SHTF the NATO 9 would be the better choice as more availability I would guess. It’s lighter to pack and I could bump up the velocities with handloads knowing that this one is not meant to “reach out and touch someone”. I’ll do that with my AR 10. Thanks Hunter. Been a pleasure……. Ed, you do have a solid point about the NATO caliber in 9mm Luger and availability. It damn sure is easier to hump than .45 Auto in numbers. Please let me know what you decide as I am curious. Will do Hunter. Appreciate your time and insight. Checked out the 9mm today. Was not impressed as I thought I’d be. Very bulky and pistol grip was way to big for my bricklayer hands and stubby fingers. Had to “fish” the mag into the well. May get better with use and knowing the weapon but to me, just didn’t feel right. Guess I’ll have to save up quite a few more pennies for the Beretta Cx4 Storm. Again, appreciate the time and considerations. Have the C9 and 380. You can spend a lot more but not get the quality and they shoot all cases without issues. I now have over 2000 rounds thru my C9 in just over 4 months. Just can’t find anything that causes me pause. I shoot between 12-15 yards most of the time and get the equivalent of head shots in good groups. I absolutely trust this gun though it is not a good cc gun it isn’t overly large either. The gun does more than MOST shooters can do…yours truly included. Not the most refined gun but accurate and absolutely reliable. Just wanted to know if there are two different 9mm pistols made by Hi Point. Was watching reviews and saw a 9mm that didn’t lock open after final shot but my c9 luger does. Also ,put a laser on my 45 acp and received two different cases with it , one for the 45 and one for the 9mm which is no way going to mount on my 9mm.No rail to mount it. New at this . There is only one Hi-Point handgun in 9mm Luger and it does lock the slide open on an empty magazine every time. Some manufactures of the mounts do not jive with the pistol as factory mounts do. Does that help any? That may have been the old pistols. (although I’ve never heard of that) The old original 9mm carbines didn’t do the last round hold open. Come on over this is a fun place! I agree Edwin, Hi-Point makes a fine firearm. Hey there Hunter, and others. I really enjoyed the review. Excellent. I also enjoyed the comments, banter, and recommendations and opinions. Can I just ask about high capacity magazine for the 4595 .45 ACP carbine? Anyone have some info about these in 14 round or greater? Specifically interested in the Pro-Mag magazines for this carbine. Thanks so much. I know of the Redball makes a 20 round magazine for the 9mm carbine and the word from Hi-Point is it works well with the carbine. As for the .45 carbine I don’t know how well the Pro-Mags work. I have heard good and bad but have no first hand experience. Been a while since I have heard anything from this site. Great to have all of you in my email again! As usual an excellent review and Thank You for your service to our Nation. I am not a firearms expert ( surprise:-) but I do know quality when I see it..read it and use it and all of those apply here. I am a lifetime student of aviation so my passion is there but I have a strong interest in firearms in general and Hi Points in particular. I have only the 380 (my wife’s) and the C9 ( mine). I have fired some 2500 plus rounds thru the 9 in the past six months at various distances out to 20 yards with many brands of ammo including aluminum, brass and steel casings. My personal conclusions are these ( sounds arrogant..sorry)….The pistols shoot anything well but brass is best. Very few hiccups but aluminum seems to be the least liked. I painted the top of the slide, the grips and bottom of the magazine Italian olive green and the sights are fluorescent green in front with white in back. Some friction strips on the grips add to the only ” mods”. No polished ramps or anything else. Not best concealed carry gun but I carry it everywhere and on the few iccassions I don’t have it I miss it. In conclusion ( really) for what it’s worth…I trust these with my and my loved ones life and lives without reservation. It is not to say that other firearms are not as good by any means. I want several and hope to have them but my HI POINT IS AND WILL BE MY GO TO FIREARM regardless of others opinions good or bad. I would just like to know how to get the 9mm version and a catalog that shows all the accessories. Any gun store should be able to get you the carbine and pistols. Thanks for the reply. Indivudual data from others sent here?? Seems like gun dealers would want to participate in a real world long haul test from experienced reviewers like yourself. During the beginning rounds to 300 rounds I had occasional feeding and firing issues. After that things settled down and the C9 performed excellently even in rapid fire multiple target shooting. At almost exactly my C9 developed seriius firing problems. As mentioned the factory sent a new spring kit and furing pin. The gun was sent to them unfortunately just before Julyshut down rill the 11th so I know nothing yet. Maybe tbe case for more expensive guns or maybe a fluke with mine. How about others? Brands? Calibers? Revolvers. Semi autos?? Very interested in hearing from folks. Either here or at my gmail. At almost exactly 3000 my C9 developed seriius firing problems. As mentioned the factory sent a new spring kit and furing pin. The gun was sent to them unfortunately just before Julyshut down rill the 11th so I know nothing yet. Just a heads up, the Pro-Mags will void the warranty. My 9mm came with a paper saying that Pro-Mag magazines do not have the proper clearance and will damage the feed ramp. This is pretty amazing since Hi-Point really seems to stand behind their product. For what it is worth, in spite of this warning, (American) customer service in the gun industry is quite amazing, my bet is that they would fix it and mumble to themselves but cheerily hand you back a fixed carbine. Finally, I went with the 9mm because it actually comes with a 10 round mag instead of a 9 round mag for the 45acp. Considering that both units are +P rated the 9mm has plenty of power, and that one extra hole punch might be the difference. Even standard 9mm rounds like Hornaday Critical Defense are pretty sweet little rounds, and at 135grain, really easy to carry up a hill. Recently got my C9 back after having to send it in due to it quit firing at the 3000 round mark. It took 4 weeks which was way longer than I was told and when inquiring about it the receptionist would not put me thru to a tech. I got the run around but also got the gun back and it shoots well. Have the 45 carbine and pistol as well as the 995TS carbine and the C9 pistol. They all work great. Have different firearms for CC as well as a Hawk 12 gauge. These Hi-Points are dependable. I don’t replace them because I can’t afford to (I can). I don’t replace them because they work and work even if they are overdue on a cleaning. They may be a Chevy instead of a Cadillac but, they repeatedly do the job. Luv my 4595! Totally reliable with No FTF, FTE, FTF Jams nothing! Operates flawlessly! Accuracy is acceptable for what it is. It’s not a tack driver, however it’s completely acceptable for HD, SD, Plinking. Polishing the trigger helps allot. Just my .02. And Hi-Point has the Redball mags on the Facebook page. They are almost out there for sale!